Blessed are the geeks, for they shall inherit the universe. From its first airing in 1999, Futurama has been enjoyed by millions. But at its twisted heart it’s always been a cartoon by nerds, for nerds. Where else can you hear gags about the Heisenberg Uncertainty Principle or see blink-and-you’ll-miss-them allusions to Fermat’s Last Theorum alongside drunken robot slapstick? Like Star Trek, which supplies so much of its spoof material, Simpsons creator Matt Groening’s futuristic animation continues to thrive despite its network cancellation after just four years. Tomorrow sees the release of Bender’s Game, the third of four feature-length straight-to-DVD episodes created to meet fans’ demand for fresh adventures from Fry, Leela, Bender and the rest of the Planet Express crew. It’s these dedicated followers who have kept the series and its offbeat universe alive, like the cryogenically preserved, celebrity heads in jars that spout so many of its funniest lines. In America, television producers have recognised the importance of establishing ongoing relationships with fans through rolling repeats and the replay value of extras-heavy DVD box sets. Shows like Heroes and Lost create complex, multi-faceted parallel worlds that encourage repeated viewing and spill over into additional content on their accompanying websites, even if occasionally, as during Heroes’ disappointing second series, it seems that the writers can’t meet fans’ expectations for the alternate world they’ve created. Although it commands arguably the biggest, most dedicated following of any television show, Star Trek’s original series only ran from 1966 to 1969, acquiring its cult fanbase chiefly through subsequent repeats. However, after 10 movies and five spin-off series, including The Next Generation and Voyager, Star Trek arguably spread the fabric of its universe too thinly and boldly ventured too far. After promising early ratings, a prequel to the original series, Enterprise, starring Quantum Leap’s Scott Bakula as Captain Jonathan Archer, rapidly declined in popularity. There’s an amusing scene in Bender’s Game that includes two mini-Enterprises among the ships competing in a space demolition derby. Flown by the heads in a jar of Bakula and George Takei, aka Mr Sulu in the original series, Takei cries “way to kill the franchise Bakula!,” before the two ships collide and explode. It’s a true Trekkies’ gag that rewards their understanding of the series’ history while gently poking fun at the inflated cultural importance it retains for them. Nevertheless, Star Trek will enjoy another resurrection next year as the newest film in the resilient saga portrays the original cast’s first meeting. The beauty of science-fiction, as successive incarnations of Doctor Who have shown, is that a series can potentially go on indefinitely, to infinity perhaps, because it’s not bound by the same narrative logic as conventional drama. Contrary to Scotty’s assertion that “ye canna change the laws of physics”, Star Trek contrives a rip in the space-time continuum whenever it suits the scriptwriters. As an animation, Futurama’s writers can be even less restrictive of their imaginations, especially when the misadventures of the heavy drinking, cigar-smoking, kleptomaniac, misanthropic, egocentric, ill-tempered robot Bender drive the plot. Yet the series seldom dumbs down, preferring to dumb it up instead and acknowledge its more perceptive viewers with in-jokes, especially those watching with PhDs in advanced quantum mechanics or a passion for Arthur C. Clarke novels. Bender’s Game does addresses such serious contemporary concerns as fuel shortages and the need for alternative energy, though thankfully there is an amusingly scatological revelation as to where exactly spaceship-powering “dark matter” comes from. 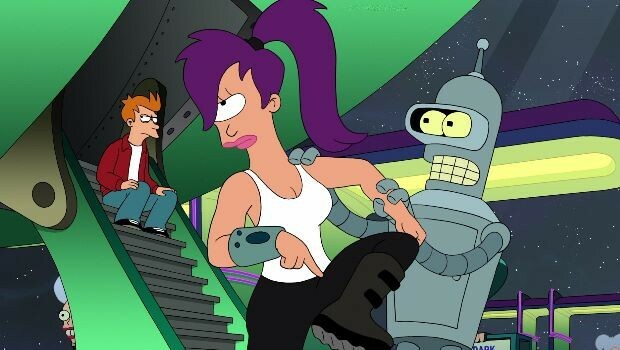 And after abandoning the continuum rip farce of the previous two Futurama films, Bender’s Game actually abandons science-fiction altogether for an even less inhibiting genre: fantasy. Specifically the roleplay of Dungeons and Dragons. As much a celebration of this nerdiest of games as it is a parody, a spurious twist of storytelling sees Bender become a medieval knight, the Professor a wizard, Leela a centaur and Fry a Gollum-like creature. It should tickle the fanboys and geekgirls among you, though any Futurama instalment without the sleazy Captain Kirk spoof Zapp Brannigan will always be missing something for me. Futurama: Bender’s Game is out now on DVD. A version of this article originally appeared in the Sunday Herald, November 2 2008.